A Step To A New Universal Theory? A method to generate recognition, auto-adaptation and self-organization in autonomous mechanisms and organisms. which is controlled by pulse sequences that have been modulated in accordance with the covariant time sequences. In this way the mechanism or organism in motion is prompted to emulate the found covariant time sequences, while being able to recognize its own motion course and adapting itself to changes of environment. systems. By means of the invention described herein, it is possible for a system in motion to recognize external events in a subjective way through self-observation; to identify the surrounding physical conditions in real time; to reproduce and to optimize the system's own motions; and to enable a redundancy-poor process that leads to self-organization. Robot systems of the usual static type are mainly based on deterministic path dependent regulating processes. The digital outputs and values that control the robot's position are stored in the memory of a central computer. Many degrees of freedom can be created by a suitable arrangement of coordinating devices. Position detectors can be devices such as tachogenerators, encoders, or barcode rulers scanned by optical sensors that provide path dependent increment pulses. The activation mostly takes place by means of stepper motors. It is also well-known that additional adaptive regulating processes based on discrete time data are used in path dependent program control units. These data are produced by means of the SHANNON-quantization method, utilizing analog-to-digital converters to sample the amplitudes of sensors and transducers. They serve to identify the system's actual value (i.e. its current state). Continued comparison of reference values and actual values are necessary for correction and adjustment of the regulating process. Newly calculated parameters are then stored in the memory. This kind of adaptive regulation is necessary, for example, in order to eliminate a handling robot's deviations from a pre-programmed course that are caused by variable load conditions. If a vehicle that is robot-controlled in this way were to be placed into an autonomous state, it would generally be impossible to determine its exact position reference (i.e. coordinates) by means of tachogenerators or encoders. For this reason controlling values (or commands) cannot be issued by a computer - or preprogrammed into a computer - in an accurate manner. This is true not only for robot-controlled automobiles, gliding vehicles, hovercraft or aircraft, but also for rail-borne vehicles for which the distance dependent incremental pulses are often inaccurate and therefore not reproducible. This is usually caused by an uneven surface or worn or slipping wheels. Explorer robots, which are used to locate objects or to rescue human beings from highly inaccessible or dangerous locations, must therefore be controlled manually, or with computer supported remote control units. A video communication system is necessary for such cases in order to be able to monitor the motion of the robot. However, in many applications of robotics, this is inadequate. A robot-controlled automobile, for example, should be capable of avoiding dangerous situations in real time, as well as being capable of adapting its speed to suit the environment, without any human intervention. In such cases, it is necessary for the on-board computer to recognize the situation at hand, then calculate automatically the next steps to be carried out. In this way the robot-controlled vehicle ought to have a certain capability for self-organization. This is also true for other robot-controlled systems. With regards to autonomous robot systems, techniques already exist to scan the surroundings by means of sensors and to analyze the digital sensor data that were acquired using the above-mentioned discrete time quantization method (see Fig. 1); and there already exist statistical calculation methods and algorithms that generate suitable regulating parameters. Statistical methods for handling such regulating systems were described in 1949 by Norbert WIENER. According to the SHANNON theorem, the scanning of the external environment must be done with at least double the frequency of the signal amplitude bandwidth. In this way the information content remains adequate. In order to be able to identify the robot's own motions, very high sampling rates are necessary. This amplitude quantization method currently in widespread use requires the correlation of particular measurement data to particular points in time (Ts) that are predetermined using the program counter. For this reason this should be understood as a deterministic method. However, practical experience has shown that even ultrahigh-speed processors and the highest sampling rates cannot provide sufficient efficiency. The number of redundant data and the amount of computing operations increase drastically when a moving sensor-controlled vehicle meets new obstacles or enters new surroundings at variable speed. Indeed, C. SHANNON's quantization method does not allow recognition of an analogue signal amplitude in real time, especially if there are changing physical conditions or variable motions for which the acquisition of additional information regarding the instantaneous velocity is necessary. This is also true if laser detectors or supersonic sensors are used, for which mainly distance data are acquired and processed. Therefore, although this quantization method is suitable for analyzing the trace of a motion and for representing this motion on a monitor (see Pat. AT 397 869), it is hardly adequate for recognizing the robot's own motion, or for reproducing it in a self-adaptive way.Some autonomous mobile robot systems operate with CCD sensors and OCR software (i.e. utilising image processing). These deduce contours or objects from color contrast and brightness differentials, which are interpreted by the computer as artificial horizons or orientation marks. Examples of this technology are computer-supported guidance systems and steering systems that allow vehicles to be guided automatically by centre lines, side planks, street edges and so on. CCD sensors - when one observes how they operate - are analog storage devices that function like well-known bucket brigade devices. Tightly packed capacitors placed on a MOS silicon semiconductor chip are charged by the photoelectric effect to a certain electrical potential. Each charge packet represents an individual picture element, termed "pixel"; and the charge of each pixel is a record of how bright that part of the image is. By supplying a pulse frequency, the charges are shifted from pixel to pixel across the CCD, where they appear at the edge output as serial analog video signals. In order to process them in a computer, they must be converted into digital quantities. This requires a large number of redundant data and calculations; this is why digital recording of longer image sequences necessitates an extremely large high speed memory. Recognizing isomorphous sequences in repetitive motions is only possible with large memory and time expenditure, which is why robotic systems based on CCD sensors cannot adequately reproduce their own motion course in a self-adaptive way. With each repetition of the same motion along the same route, all regulating parameters must be calculated by means of picture analysis anew. If environment conditions change through fog, darkness or snowfall, such systems are overburdened. Pat. AT 400 028 describes a system for the adaptive regulation of a motor driven vehicle, in which certain landmarks or signal sources are provided along the vehicle's route in order to serve as bearing markers that allow the robot to keep to a schedule. Positions determined by GPS data can also serve this purpose. When the system passes these sources, the sensor coupled on board computer acquires the elapsed times for all covered route segments by means described in Pat. U.S. 4,245.334, which details the manner of time quantization by first and second sensor signals. The data acquired in this way serve as a reference base for the computation of regulating parameters that control the drive cycles and brake cycles of the vehicle when a motion repetition happens. The system works with low data redundancy, corrects itself in a self-adaptive manner, and is capable of reproducing an electronic route schedule precisely. It is suitable, for example, for ensuring railway networks keep to schedule. 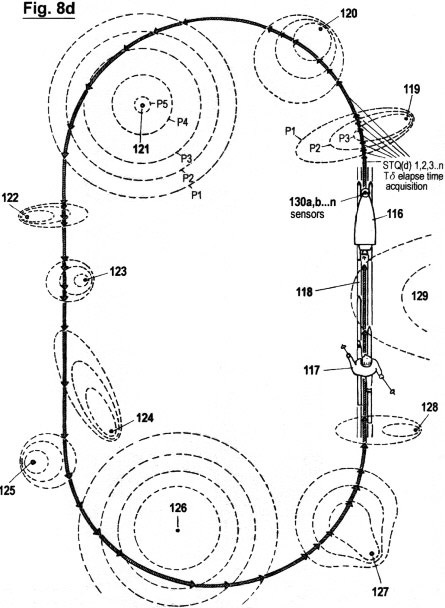 However, in the system detailed in the above-mentioned patent, it is not possible to identify external objects and surroundings. It is an object of the present invention to provide an extensive method for the creation of autonomous self-organizing robot systems or organisms, which enables them to identify external signals, objects, events, physical conditions or surroundings in real time by observing from their own subjective view. They will be able to recognize their own motion patterns and to reproduce and optimize their behavior in a self-adaptive way. Another object of this invention is the preparation of an autonomous training robot for use in sports, that is capable of identifying, reproducing and optimizing a motion process (e.g. that has been trialed beforehand by an athlet) as well as: determining the ideal track and speed courses automatically; keeping to route schedules; representing its own motion, speeds, lap times, intermediate times and start to finish times on a monitor; and which is capable of acoustic or optical output of the acquired data. STQ elapse times in a signal-recognition process are quantized with every transition of a phase amplitude through a threshold value (which is effected by starting and stopping a number of timers). This produces a stream of time data. Every time elapsed between phase transitions in the "equal zone", as well as the time elapsed between transitions through a low threshold value then a higher threshold value (and vice versa), can be recorded. This is the elapsed time determined by the signal amplitude that occurs when a first sensor (or receptor). S2 and an equivalent second sensor (or receptor) S1 moves along a corresponding external signal source Q, measured from the rising signal edge at the phase transition iTv1.1 of the first sensor signal to the rising signal edge at the phase transition iTw1.1 of the second sensor signal; and likewise from iTv2.1 to iTw2.1, from iTv3.1 to iTw3.1. (These transitions correspond to equivalent threshold values P1,2,3...) STQ(v) times can also be measured from falling signal edges. They serve as parameters for the immediate relative velocity (vm) of the system in motion. This is the elapsed time determined by the signal amplitude of a sensor (or receptor) S in the field of a corresponding external signal source Q; and/or determined by the signal amplitude of a sensor (or receptor) S that is moving along several equivalent external signal sources Q1,2,3... This elapsed time is measured from the rising signal edge at the phase transition iTw1.1 to the falling signal edge at the phase transition iTw1.2, likewise from the rising edge at iTw2.1 to the falling edge at iTw2.2, and from the rising edge at iTw3.1 to the falling edge at iTw3.2 etc. ; or, equivalently, from the falling signal edge at the phase transition iTw1.2 to the rising signal edge at the phase transition iTw1.3; and from the falling edge at iTw2.2 to the rising edge at iTw2.3, from the falling edge at iTw3.2 to the rising edge at iTw3.3, and so on (These transitions correspond to the equivalent threshold values P1,2,3..). If the time counting frequency for the STQ(i)-quantized elapse times Tw(1,2,3...n) is modulated in proportion to the immediate relative speed vm (which is detected by means of STQ(v) parameters), then the counted time pulses correlate to the relative distances through which the sensor coupled system is moving. Therefore, of course, the adapted elapse times are not identical to real physical measured times that would have been acquired from those relative lengths by usual timers. However, with absolute physical invariance between the system in motion and the surroundings (i.e. synchronism), no STQ parameter can be acquired. relative motion processes so as to be able to recognize the self-motion (or components of this motion); as well as to reproduce any motion in a self-adaptive manner. 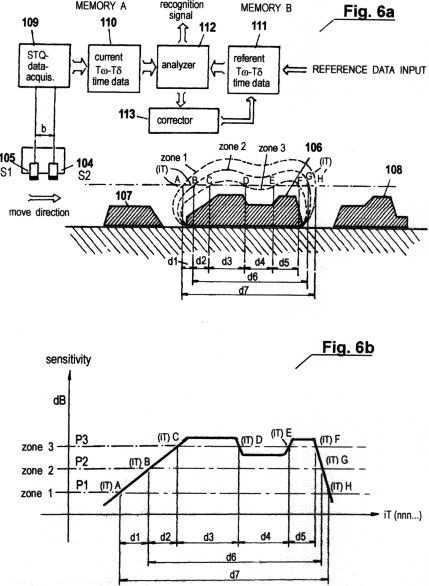 perception area zones may normally be set by a number of electronic threshold value detectors with pre-definable threshold levels, and the STQ(i) and STQ(d) elapse time data are acquired by programmable digital timers. The elapse timing process is actuated at an iT phase transition as well as halted at an iT phase transition. Then the time data are stored in memory. Moreover, these STQ(v) elapse times are recorded by means of electronic integrators, in which the charge times of the capacitors determine those potentials that are applied as analog STQ(v) data to voltage/frequency converters, in order to modulate the digital time pulse frequencies for the adaptive measurement of STQ(i) and STQ(d) data, in a manner which is a function of the relative speed vm. In non-mechanistic implementations of the method presently being described, it is intended that the so-called perception area zones, as well as the threshold value detectors and the previously described STQ-quantization processes, are not formed in the same manner as in electronic analog/digital circuits, but in a manner akin to molecular/biological structures. In other general implementations, it is intended that those time stream patterns that consist of currently recorded STQ data be continuously compared with prior recorded time stream patterns by means of real time analysis, in order to identify external events or changes in physical surroundings with a minimum of redundancy, as well as to recognize these in real time. that are equipped with sensors and facilities capable of the kind of time stream pattern recognition mentioned above, have propulsion, steering and brake mechanisms that are regulated in such a manner, that the autonomously moving system (in particular, a mobile robot system) is capable of reproducing prior recorded STQ time stream patterns in a self-adaptive way. When repeating this movement, a processor deletes unstable or insufficiently co-ordinated time stream data from memory, while assigning only those time stream data as instruction, which allows reproduction of the motion along the same routes in an optimal co-ordinated manner. In addition, it is intended that the time base frequency for the above mentioned STQ elapse timing is increased or decreased in order to scale the time sequences proportionally, whereby the velocity of all movements is proportionally scaled too. Finally, it is intended to focus the perception zones defined by threshold values, in order to facilitate recognition of invariant source fields and/or to ensure that motion courses are repeated uniformly, if convergence cannot be achieve sufficiently often. 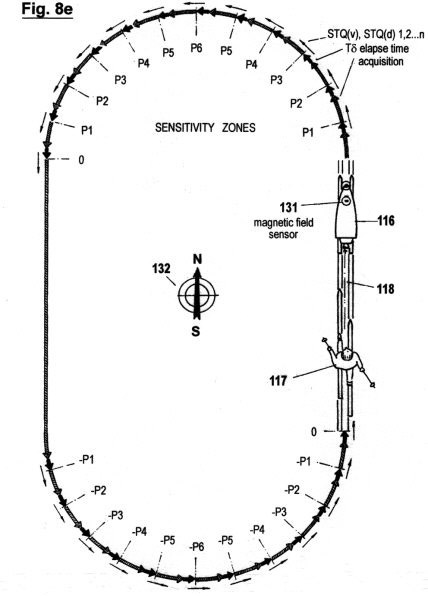 (This is object of an additional patent application). Fig. 1 shows a diagram of SHANNON's deterministic method of discrete time quantization of signal amplitude traces. Figs. 2a-c are graphic diagrams of the quantization of signal amplitude traces by means of acquisition of STQ(v), STQ(i) and STQ(d) elapse times, according to the herein described non-deterministic method. Figs. 3a-c illustrate this non-deterministic quantization method in connection with serial transfer of acquired STQ(d)- elapse times, as well as time pulse frequency modulation of simultaneously acquired parameters of the immediate relative speed (vm). Figs. 3d-g illustrate, in accordance with the presently described invention, a method to compare the currently acquired STQ time data sequences with prior recorded STQ time data sequences, in order to detect isomorphism of certain time stream patterns. Fig. 4b shows vm dependent action potentials which propagate from a sensory neuron (receptor) along a neural membrane to the synapse where the covariance of STQ sequences is analysed. Fig. 4c shows a number of vm dependent action potentials, which propagate from a group of suitable receptors along collateral neural membranes to synapses, at which the "temporal and spatial facilitation" of AP's is analysed together with the covariances of these STQ sequences in order to recognize a complex perception. Fig. 4d shows a postsynaptic neuron that produces potentials with inhibitory effects. Fig. 4e and Fig. 4f show the general function of the synaptic transfer of molecular/biologically recorded STQ information to other neurons or neuronal branches. Fig. 5 shows a configuration where the described invented method has been applied to generate an autonomous self-organizing mechanism, and where the STQ time data are acquired by means of electronics. Fig. 6a shows a configuration of a concrete embodiment of the present method, where (as in Figs. 2a - 2c) the acquired STQ(v), STQ(i) and STQ(d) time data are applied to the recognition of certain spatial profiles, structures or objects when the system is in motion at arbitrary speed. Figs. 6b-e illustrate several diagrams and schedules in accordance with the particular embodiment in Fig. 6a, in which the sensory scanning and recognition of certain profiles can occur under invariable or variable speed course conditions. Figs. 7a-d show several configurations of sensors and sensor structures for the recording of STQ(v) elapse times, which serve as parameters of the immediate relative velocity vm. Figs. 8a-f illustrate a configuration, as well as the principles under which another embodiment of the invention functions, in which the acquisition of STQ time data (see Figs. 2a - 2c) is used to create an autonomous self-adaptive and self-organizing training robot for use in sport. This embodiment is capable of reproducing and optimizing motion processes that have been pre-exercised by the user. It is also capable of determining the ideal track and speed courses automatically; of keeping distances and times; of recognizing and warning in advance of dangerous impending situations; and of representing on a monitor the self-motion, in particular the speed, lap times, intermediate times, start to finish times and other relevant data. In additional, this embodiment is capable of displaying these acquired data in an optical or acoustic manner. Fig. 9 shows a schematic diagram of the automatic focusing of certain perception zones or threshold values, through which it is intended to improve and optimize the recognition capability and the auto-covariant behaviour of the system in motion. 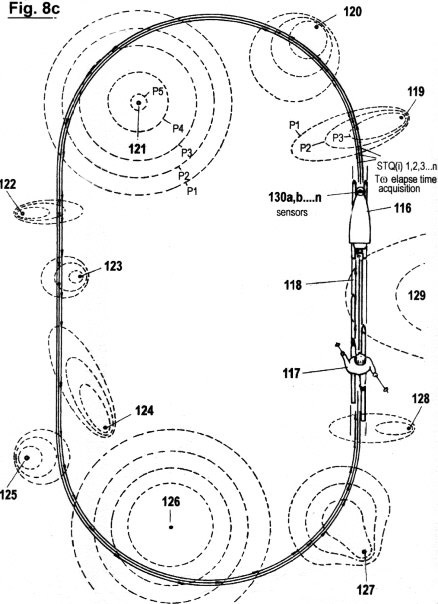 (This point is object of an additional patent application). transitions at certain sensory perception areas or sensitivity zones (or threshold values, respectively) in autonomous self-adaptive and self-organizing structures, organisms or mechanistic robot systems, where a multiplicity of types of sensors or receptors can exist. Fig. 1 shows a diagram of SHANNON's deterministic method of discrete time quantization of signal amplitude traces, which are digitized by analog/digital converters. In the usual technical language this method is called "sampling". This deterministic quantization method is characterized by quantized data (a1,a2,a3 ...an) which correlate to certain points in time (T1,T2,T3, ...Tn) that are predetermined from the program counter of a processor. In present day robotics practice, this currently used deterministic method requires very fast processors, high sampling rates and highly redundant calculations for the processing and evaluation of data. If one wants to acquire sensor data from signal amplitudes of external sources for the purpose of getting information about the spatial surroundings of a system in which a sensor coupled processor is installed, SHANNON's method is incapable of generating suitable data for the immediate relative speed and temporal allocation, data which are necessary to optimize the coordination of the relative self-motion. A recognition of its own motion in real time therefore is not possible. For this reason, this currently used deterministic method is inadequate for the generation of highly effective autonomous robot systems. Figs. 2a - c show three different graphs of direct "sensory quantization" of signal amplitude traces by means of the herein described invented method. In contrast to the quantization method shown in Fig. 1, in this method no vertical segments of amplitude traces are scanned; there are only elapse time measurements carried out in three different complementary ways. As is easy seen, it is necessary to predefine certain numbers of threshold values 1 (P1, P2, ...Pn) in order to provide different sensory perception zones. Each residence time within a zone and time interval between zones is recorded, as well as the elapse time between the transition from a lower to a higher threshold value and vice versa. Fig. 2a shows the first of these three types of sensory time quantization. It is designated STQ(v) elapse time (i.e. sensitivity/time quantum of velocity), and produces a parameter for the relative moment speed vm. It can also be understood as the time duration between the phase transitions of two parallel signal traces at the same threshold value potential. That is similar to the standard term "phase shift". In the graph, the measured STQ(v) elapse times are designated with Tv(n). The phase transitions at the amplitude trace V, which is produced when the sensor (or receptor) 2 passes along a corresponding external signal source 4, are designated iTv(n.n); the phase transitions at the amplitude trace W, which are produced when the sensor (or receptor) 3 passes along the same signal source, are designated with iTw(n,n). In the ideal case, the sensors 3, 4 are close together compared to the distance c between external signal source and sensors, c remains approximately constant, and both sensors (or receptors) display identical properties and provide an analogue signal; then two amplitude traces V and W are produced at the outputs of the mentioned sensors (the sensor amplifiers or receptors, respectively) which are approximately congruent. (Deviations from ideal conditions are compensated by an autonomous adaptation of the sensory system in a continuously improved way, which is described later). When sensor 2, in the designated direction, moves along the signal source 4, then the signal amplitude V passes through the predefined threshold potential P1 at phase transition iTv(1.1). The rising signal edge actuates a first timer that records the first STQ(v) elapse time Tv(1). The continually rising signal amplitude V passes through the threshold potentials P2, P3 and P4; the phase transition of each of these activates further timers used for recording of further elapse times Tv(2), Tv(3) and Tv(4). Meanwhile, sensor 3 has approached signal source 4 and produces the signal amplitude trace W. When W passes through the threshold potential P1 at the phase transition iTw(1.1), the rising signal edge stops the timer, and the first STQ(v) elapse time is recorded and stored. The same procedure is repeated for the elapse times Tv(2), Tv(3) and Tv(4), when the signal amplitude passes through the next higher threshold values P2, P3 and P4. If V begins to fall, it first passes through the threshold value P4 on the falling shoulder of the amplitude trace. Now, the falling signal edge activates a timer that records the next elapse time Tv(5). At the further phase transitions iTv(3.2) and iTv(2.2), where the threshold values P3 and P2 are passed downwards, there are also timers which are actuated when the signal edges fall, in order to measure the elapse times Tv(6), Tv(7). If the signal amplitude V rises again, the STQ(v) parameters are recorded by the rising signal edges again. The same procedure is applied to stopping the timers at the phase transitions of the signal amplitude W. This produces the time displacement. Fig. 2c shows a third type of sensory STQ quantization that is completely different to those of Figs. 2a and 2b. It is termed STQ(d) elapse time (i.e., sensitivity/time quantity of differentiation); and it can be understood as the time duration Td, measured between a first phase transition at a first predefined threshold potential up to the next phase transition at the next threshold potential, which can be either higher or lower than the first one. STQ(d) elapse times are parameters for the slope of signal amplitude traces, and consequently they are parameters for their frequency. By fast comparison of STQ(d) elapse times, signal courses can be recognized in real time; therefore, for the creation of intelligent behavior, STQ(d) quanta are just as imperative as STQ(v) quanta and STQ(i) quanta. The quantization of STQ(d)-elapse times is possible under all variable physical states and arbitrary relative motion between sensor and external sources, in which STQ(v) and STQ(i) elapse times are also quantizable. If the STQ(d) elapse times are acquired cumulatively and serially, then they can be used in the verification and plausibility examination of STQ(i) elapse times (which are likewise acquired). In the graph, the measured STQ(d) elapse times are designated with Td(n). 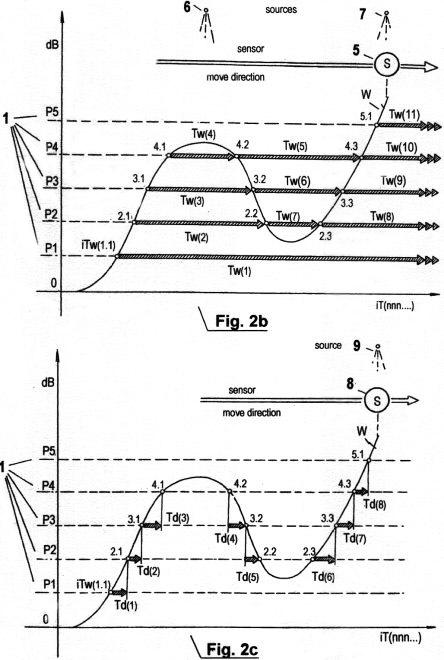 The phase transitions which are produced by the amplitude trace W when the sensor (or receptor) 8 is in the field of a corresponding signal source 9, are designated with iTw(n.n). When sensor 8 moves along the corresponding signal-source 9 in the direction shown, at first the signal amplitude W passes through the pre-defined threshold value P1 at the phase-transition iTw(1.1). Of course, this also happens when the field of this signal source is active and/or variable, although the sensor and the corresponding signal source are in an invariant opposite position. The rising signal edge activates a first timer that records the first STQ(d) elapse time Td(1). When the rising amplitude trace W passes through the next higher threshold value P2 at the phase transition iTw(2.1), this timer is stopped and the measured STQ(d) elapse time Td(1) is stored. Simultaneously, the next timer is activated, and records the elapse time up to the next phase transition at iTw(3.1), upon which it is stopped; then the next timer is activated up to the next transition iTw(4.1), upon which it is stopped again, and so on. (All the measured elapse times are stored in memory). At the phase transition iTw(4.1) the next timer is activated by threshold potential P4. However, since the amplitude trace does not reach the next higher threshold value before falling to P4 again, no STQ(d) can be acquired with the last timer. Thus in this position only the quantization of STQ(i) elapse times, as described in Fig. 2b, can take place. The next STQ(d) elapse time Td(4) can only be acquired when the signal amplitude falls below the threshold value P4 at the transition iTw(4.2), upon which the next timer is activated, and stopped when the phase transition at the next lower threshold value P3 occurs. Simultaneously, the next timer is activated, and so on. In mechanistic applications, where the analysis of signal amplitudes requires the quantization of STQ(d) elapse times, STQ(d) data are often acquired in combination with STQ(i) data. If it is intended to use this quantization method to enable a robot to recognize its own motion from a subjective view (by detecting and scanning the spatial surroundings when one moves along external signal sources), then STQ(v) and STQ(i) data are predominantly acquired. However, if the main intention is to recognize external, non-static optical or acoustic sources such as objects, pictures, music or conversations etc., then the proportion of STQ(d) parameters increases, while the proportion of STQ(v) parameters decreases. In the case of physical invariance (i.e. when there is no relative motion) no speed parameters can be derived from any sensor signals, and only STQ(d) and STQ(i) elapse times are quantized. Figs. 3 a - c illustrate an important aspect of the performance of the present method, in connection with serial transfer of acquired STQ(d) elapse times, as well as in connection with time pulse frequency modulation in relation to simultaneously acquired STQ(v) parameters which represent the instantaneous relative speed (vm). However, this instantiation of the method is only suitable where mainly STQ(d) elapse times are measured, together with those STQ(i) elapse times (see also Fig. 2c) which are produced at the phase transitions when maximal threshold value near the maximum of the amplitude are reached, or when the minimal threshold value near the minimum of the amplitude is reached. In this case, all measured elapse times can be represented as serial data sequences. But if each phase transition at each threshold potential generates STQ(d) elapse times as well as STQ(i) elapse times (see also the notes for Fig. 5), then these data are produced in parallel, and therefore they have to be processed in parallel. certain characteristic frequencies. In this figure, these "markers" are pulses with period t(P1), t(P2), t(P3)... and frequencies f(P1), f(P2), f(P3).... These are modulated according to the respective threshold potentials. These identification pulses (IP) serve to identify the pre-defined threshold values P1, P2, P3...., (or the perception zones 1, 2, 3..., respectively). Only these identification pulses, in cooperation with invariable time counting pulses (ITCP) with the period tscan, or in cooperation with variable (vm modulated) time counting pulses (VTCP) with the period t.vscan (see also Figs. 3b, 3c), enable the actual acquisition of the STQ(d) elapse times Td(1), Td(2), Td(3), Td(4),... (or, respectively, the STQ(i) elapse times Tw(1), Tw(2), Tw(3), Tw(4),.... that are produced at amplitude maxima or minima), as we have already described. Variable VTCP pulses with the period t.vscan, which are automatically modulated relative to the acquired STQ(v) parameters (i.e., the instantaneous moment speed vm), are used to scan the signal amplitudes that are derived from external sources, in a manner proportional to speed. This reduces the redundancy of the calculation processes considerably (see also Fig. 3c). The STQ(d) elapse times that are acquired in such a vm-adapted manner by VTCP pulses are designated with Tδ; the STQ(i) elapse times, acquired in the same manner, are designated with Tω 1,2,3...). Fig. 3b shows the measurement of STQ(d) elapse times with invariant ITCP pulses with period tscan and constant frequency fscan. This takes place as long as no STQ(v) parameter is acquired, e.g. when no relative motion is present between sensor and signal sources, and therefore when can be measured. Fig. 3c shows the measurement of STQ elapse times with modulated VTCP pulses. These counting pulses depend on the instantaneous relative speed vm (or on the acquired STQ(v) parameter, respectively) as well as their period t.vscan and frequency ƒscan in a manner that is proportion to vm. If vm is very small or tends to zero, then the counting frequency ƒscan is likewise reduced to the minimum frequency fscan (as seen in Fig. 3b). As shown in Fig. 2a, each STQ(v) parameter is acquired by means of a second adequate "front" sensor (or receptor). Vm is thus already recorded even before the actual STQ(d) and/or STQ(i) elapse time measurement. Therefore it is possible automatically to modulate ƒscan for the measurement of Tδ data according to the acquired STQ(v) parameters, in order to reduce the number of t.vcalculations as well as to minimize memory requirements. Thus, a largely redundancy-free analysis results. Although the time impulses counted with this method are approximately covariant with the covered lengths (d), it can be proved that they nevertheless represent modified time data, and not distance data. As with the origin of those data, the further processing and analysis of such modified STQ elapse times Tδ (n) is dependent on probabilistic principles. The time data T δ (n) are effectively "subjectively sensed". 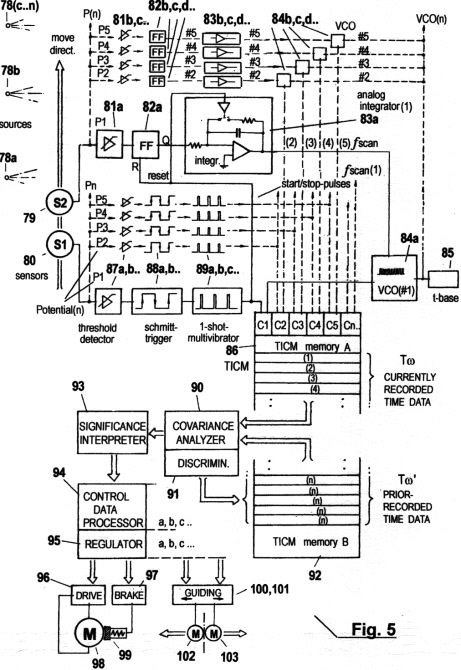 In mechanistic systems the modulation of time counting frequencies in a manner proportional to distance traveled is done chiefly by means of programmable oscillators and timers, as illustrated in Fig. 5. However, in complex structured biological/chemical organisms, this self-adaptive process (a part of the so-called "autonomous adaptation") is generated mainly by proportional >alteration of the propagation speed of timing pulses in neural fibers, as shown in Figs. 4a -d. However, autonomous adaptation and self-adaptive time base-altering processes of the type described can also be formed differently. They can exist on molecular, atomic or subatomic length scales. The author names this principle "temporal auto-adaptation". or "fuzzy logic" can be used. "autonomous adaptation", respectively). This principle is hereby termed "motoric auto-adaptation"
sequences, and if approximate covariance appears, then the sequences fit like a key into a lock. molecular/biological organisms and other systems. In such systems, this "bootstrapping"
used by H. HAKEN in the year 1970.) Successful potting is determined by speed and direction. (and when the covariance does not adequately take into account the changing pattern). to prior recorded STQ time patterns that the analyzer finds to be covariant. density signals are generated that propagate to other neighboring neural systems or to effectors. (a) If the threshold P1 is not exceeded, then a so-called "electrotonic potential" EP is produced which propagates passively along the cell membrane (or axon fiber), and which decreases exponentially with respect to time and distance traveled. The production of EP is akin to igniting an empty fuse cord. The flame will stretch itself along the fuse, becoming weaker as it goes along, before finally going out. EP's originate with each stimulation of a neuron. (b) If the threshold P1 is exceeded, then an "action potential" AP (as in Fig. 4a) is produced whichpropagates actively along the cell membrane (or axon fiber) with a constant amplitude in a self-regenerating manner. The production of AP is akin to a spark incident at a blasting fuse: the fiercely burning powder heats neighboring parts of the fuse, causing the powder there to burn, and so on, thus propagating the flame along the fuse. If an EP, in answer to a receptor stimulus, exceeds a certain threshold value (P1) 13, then an AP is triggered. The amplitude trace of an AP begins with the upstroke 14 and ends with the repolarisation 15, or with the so-called "refractory period", respectively. At the end of this process, the membrane potential decreases again to the resting potential P0, and the ionic distribution returns to equilibrium. Not each receptor stimulus generates sufficient electric conductivity to produce an AP. As long as it remains under a minimal threshold value P1, it generates only the electrotonic potential EP (introduced above). (For a better understanding of elapse time measurements in biological/chemical structures, see Fig. 2c and Fig. 3a). The first AP, which is triggered after a receptor is stimulated, generates initially (indirectly) the impulse that activates the first timer that records the first STQ(d) elapse time, when the signal amplitude W passes through the threshold value of the potential P1 at phase transition iTw(1.1). This signal represents simultaneously an identification pulse IP. The first AP corresponds to the first IP in a sequence of IP's that represents the respective threshold value status or perception zone in which the stimulation amplitudes were just found. As long as the stimulus at the receptor persists, an AP 16a, 16b... is triggered in temporal intervals whose duration depends on the respective thresholds in which the stimulus intensities have just been found. membrane channels into the intracellular space. A cell membrane can be understood as an electric capacitor, in which two conducting media, the intracellular and the extracellular solution, are separated from one another by the non-conducting layer, the membrane. The two media contain different distributions of Na/K/Cl ions. The greater the "stimulation dynamics" (see below) that first influences the outer molecular media - corresponding to sensor 2 in Fig. 2a - and, subsequently, the inner molecular media - which corresponds to sensor 1 in Fig. 2a - the faster is the Na+ influx and the shorter the charging time (which determines the parameter for the relative speed vm), and the faster is the AP propagation velocity v(ap) in the neighbouring membrane districts. The signals at the inner and outer sides, respectively, of the membrane, correspond to the signal amplitudes V and W. The velocity v(ap), therefore, indirectly generates the invariant time counting pulses ITCP or the variable vm-proportional time counting pulses VTCP. The STQ(d) time patterns Tδ(1,2,3,4,.....), measured adaptively according to the vm, are constantly compared to and analysed together with the previously measured and stored STQ(d) time patterns Tδ'(1,2,3...). This time comparation process occurs continuously in the so-called synapses, which are the junctions to axional endings of other neurons. The probability density values that are produced at the synapses, and which are used to represent the convergence of both regression curves, are communicated for further processing to peripheral neural systems, or to muscle fibres in order to trigger motoric reflex. individual synapse releases the contents of a vesicle into the subsynaptic cleft. Simultaneously, this produces an EPSP at the subsynaptic membrane of the neuron. These EPSP potentials are mostly below the threshold. The required threshold value for the release of an AP is reached only when a number of EPSP's are summed. This happens only when a so-called "temporal facilitation" of such potentials occurs, as described in the previous paragraph. Postsynaptic Potential " , or IPSP. As seen in the figure, the IPSP potentials 61, 62, 63, 64 and 65 at the subsynaptic membrane 60 are negative compared to the corresponding EPSP's. IPSP's are produced by a considerable proportion of the synapses to effect pre-synaptic inhibition instead of activation. The example here shows an IPSP packet 67 propagating from the motoaxon 66 to a neuromuscular junction (or muscle fibre, respectively) which prevents this muscle from being activated - even if a supraliminal EPSP were to reach the same muscle fibre at the same time via a parallel motoaxon. The comparison of the current elapse time pattern with prior recorded elapse time patterns, as shown in Fig. 3c, takes place continuously in the synapses. Each recognized covariance of a new time sequence, that is recorded by "temporal auto-adaptation", sets a type of "servoloop mechanism" in motion. It initiates a process that we term "motoric auto-adaptation", and which can be understood as the actual "motor" in biological chemical organisms, or life forms, respectively. Structures of temporal and motoric auto-adaptation, which are based on STQ quantization, exist also at the lowest molecular level. impossible. This applies especially to the motion of proteins; to the recognition and replication of the genetic code; and to other basic life processes. The creation of higher biological/chemical order and complex systems such as synapses or neurons presupposes the existence of an STQ quantization molecular sub-structure, from which simple acknowledgement and self-organization processes at a lower level derive. Indeed, there are innumerable hierarchies of auto-adaptive phenomena on various levels. Simple phenomena on a molecular level also include: fusion of receptor molecules; the formation of pores, ion canals and sub-axonal transportation structures (microtubules); and the formation of new synapses and axonal branchings. 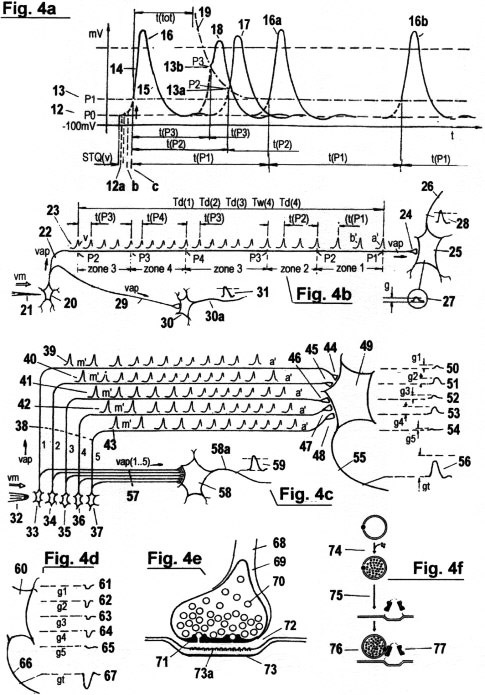 By this token, recognition of stimulation signal sequences by synaptic time pattern comparison (as an involuntary reflex or as a conscious perception), as discussed in the description of Figs. 4a - c, is an STQ-epiphenomenon. Each such auto-adaptive STQ-epiphenomenon, for its part, is superimposed from STQ-epiphenomena of higher rankings; for example, the analysis of complex "time landscapes" in order to find isomorphism. STQ-epiphenoma such as regulation of blood circulation, body temperature, respiration, the metabolism, seeing, hearing, speaking, smell, the co-ordination of motion, and so on, are for their parts superimposed from STQ-scenarios of higher complexity, including consciousness, thought, free will, conscious action, as well as an organism's sensation of time. In all these cases, the central nervous system looks after convergent time patterns that are placed like pieces of a jigsaw puzzle into an integrated total sensory scenario. If, in any hierarchy, within a certain "latency time" (i.e. time limit) and despite intensive "searching", no time subpattern covariant with the STQ time pattern can be found, then the organism displays chaotic behaviour. This behaviour restricts itself to that synaptic part in which the non-convergence has appeared. As soon as a covariant time pattern is found, the co-ordinated process of temporal and motoric auto-adaptation (and auto-emulation) resumes. (This can be likened to servo-steering that has collapsed for a short time.) However, the "chaotic behaviour" is itself quantized as an STQ time pattern, and is recorded by the affected synapses in such a manner that no neurotransmitter substance release occurs despite arriving AP's. Via subaxonal transportation structures (i.e. the microtubules) such information streams back borne on transmitter molecules which travel in the inverse direction along the axon. Microtubules are used to generate new synapses and synaptic connections at the neurons and neural networks in which a collapse of an auto-adaptation process has occurred. The production of new synapses proceeds to the generation of dendrites; i.e., axonal branches that carry processing information from neurons. In this way the auto-adaptive neural feedback mechanism regenerates itself, and the STQ time pattern that was acquired during the short termed "chaotic behaviour" becomes a new reference basis for the recognition of future events. Thus, the CNS learns to record new events and experiences; and learns to evaluate time patterns which were unknown previously. Fig. 5 shows a configuration in which the described invented method is applied to generate an autonomous self-organizing mechanism, in particular a robot, in which the STQ quanta are acquired by means of mechanistic sensor technology and electronic circuits. In contrast to Figs. 4a - f, in the particular case shown here, nearly exclusive STQ(i) elapse times together with STQ(v) elapse times (which are required for the measurement of the relative instantaneous speed vm) are quantized. The time data streams, designated as Tω, are obtained from these vm-adaptive STQ(i) elapse time measurements. It would nevertheless be advantageous to acquire also STQ(d) quanta, which can serve to verify the recorded time data stream Tω. In contrast to molecular/biological organisms, in mechanistic systems it is not possible to place a comparably large number of sensors adjacent to one other on narrow sites. It is therefore necessary to acquire as many STQ elapse times as possible from the available mechanistic sensor technology, in order to attain a sufficiently large reference base for the subsequent statistical analysis. It is also worth reiterating that, as described in Fig. 3a, in multiple STQ(i) quantization, parallel and simultaneous time data are produced, so that this data must also be processed in a parallel manner. This figure shows a block diagram for a mobile autonomous robot that has the ability to reproduce motion sequences in an auto-adaptive manner, and to optimize the timing of its own motion sequencesby continuous scanning and recognition of the physical surroundings. The robotic system is equipped with equivalent adjacent sensors 79 and 80, which produce analog output signals, and that are inter-connected with threshold detectors 81a,b,c,d,e... and 87a,b,c,d,e... . When sensor 79 (the "V-sensor")moves along the corresponding external signal source 78a in the designated direction, its signal amplitude first breaks through the lowest potential P1, which is determined by the threshold detector 81a (see description of Fig. 2b). The Flip-flop IC 82a (output set to = H ) is thereby triggered. (A Schmitt-trigger IC and a monoflop IC should be preadded in order to generate short pulses at each phase transition.) The subsequent resettable precision integrator IC (1) 83a provides a continually ascending analog output signal which modulates the output frequency ƒ of the programmable oscillator IC (VCO) The frequency ƒ is communicated to the input of a digital TICM (a multiple time counting andstoring IC 86 (C1)) and whereby the current vm-adaptive time counting frequency ƒscan(1) (see also Figs. 3b,c) is produced. The integrator IC (1) 83a therefore carries out the STQ(v) quantization. It acquires the elapse time Tv(1) in the form of a potential increase, which is then converted by theVCO(1) 84a into a time counting frequency ƒscan(1), and which is inversely proportional to the relative velocities vm(n...) with which the robotic system is moving relative to the spatial surroundings. 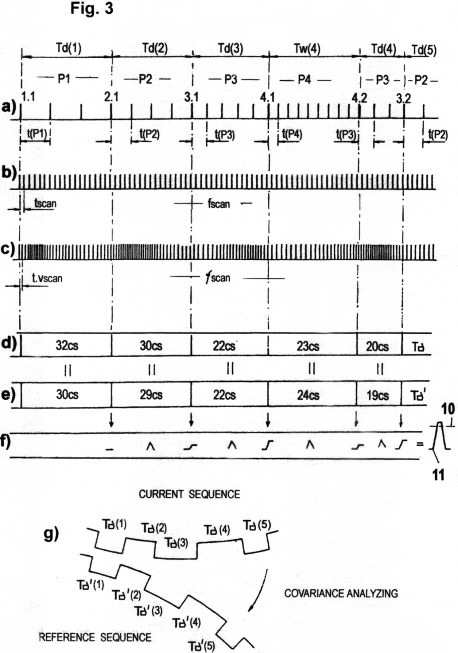 Simultaneously an impulse is again produced by IC's 87a, 88a and 89a, which stops the measurement ofthe elapse time Tw (1) in the TICM 86(C1), and stores the counted vm-modulated time pulses into the time data memory (C1). In the memory area C1 are stored the T w time data that refer to the lowest< potential P1; e.g. Tw(1), Tw(8), Tw(15) etc. Quantization of all STQ elapse times that refer to the higher potentials P2, P3, P4, P5 etc. is handled in the same manner as for P1. When the signal amplitude from sensor 79 passes through the threshold potentials P2, P3, P4, P5.... (determined by detectors IC's<81b, c, d e...), the outputs of flip flops 82b,c,d,e... are sequentially triggered to = H and therefore the subsequent integrator IC's 83b,c,d,e... generate continuously rising analog output levels, which serve to steadily decrease the frequencies ƒscan (produced by the VCO's 84b,c,d,e ..) until the signal amplitudesfrom sensor 80 goes through the higher threshold potentials P2, P3, P4, P5..(determined by detector IC's 87b,c,d,e...), when sensor 80 expands to the perception area of the signal source 78a. As a result, the Schmitt trigger IC's 88b,c,d,e... are affected, and the mono flop IC's 89b,c,d,e... produce impulses that start the acquisition of vm-adaptive elapse time data Tw( 1, 2, 3, 4...n) in the TICM 86 (C2,C2,C3, ...Cn). The recording of these data is carried out while the momentary vm-adaptive time counting frequencies ƒscan(1,2,3,4,. ..n) are valid, because simultaneously transmitted reset impulses to the flip flop IC's 82b,c,d,e... hold the output levels at the integrator IC's 83b,c,d,e... fixed, whereby thecurrent output frequencies ƒ(1,2,3,4 ...n) are programmed at the VCO's 84b,c,d,e... In the same mannerthe consecutive quantization of further elapse times T( takes place when the sensors 79, 80 move along subsequent signal sources 78b,c,d,e... All quantized STQ(i) time date are filed in the TICM 86(C....n). In the memory area C2 (see the corresponding Fig. 2b) are filed the elapse times Tw(2), Tw(7), Tw(14).. that refer to the perception area (potential) P2; in the memory area C3 are filed the elapse times Tw(3), Tw(6), Tw(13)... that refer to the next higher potential P3; in the memory area C4 are filed the elapse times Tw(4), Tw(5), Tw(12)... that refer to the next higher potential P4...; and so on. The Tw-sequences currently streaming into the TICM are generated by the current motion of the sensor-coupled autonomous mechanism (e.g. "robot vehicle") along some track. In the case shown, the positions of the sensors are temporally deviating according to the positions of the external signal sources (physical surroundings). In the case of absolute physical invariance between the mobile robot system and the surroundings (so-called synchronism), no STQ parameter and no Tw-sequence can be acquired. If such physical invariance is not occurring, then it is possible for the autonomous vehicle to recognize its own motion along the track by continuous comparison of currently acquired STQ elapse time patterns Tw(1,2,3,4...n) with prior recorded STQ elapse time patterns Tw'(nnnnn); and it is also possible for it to perfect the recognized motions continually in an auto-adaptive manner. A prerequisite for this is that the vehicle is equipped with a drive and brake system controlled by data which are calculated on the basis of continuous statistical time data analyses. 78a,b,c,d,e... in a manner such that the current motion course is temporally and spatially approximately isomorphic to that former motion course from which the referential time data sequence Tw'(nnnn..) is derived. For this purpose,the TICM 86, in which the current time data are recorded, and the memory 92, in which the prior recorded time data Tw'(nnnn..) are stored, are interconnected with a covariance analyser 90 and discriminator logic 91, which verifies the elapse time data and tests them for plausibility. Invalid time data are deleted and/or interpolated, whereby no breakdown of a data-supported servoloop can occur. Analyzer 90 and discriminator 91 continuously scan the memory 92 with very high frequency to find approximately covariant time data patterns. Significant data sequences are transferred to the interpreter> that decides the respective probability density and the value of covariance. If significant covariance exists, then the processor 94 calculates the appropriate actuating data for keeping an isomorphic course of motion. These data reach the control module 95, where they are transformed into impulses 96, 97 for the drive and brake system 98, 99. It is advantageous to extend this arrangement by incorporating energetic impulses for a steering and contra-steering system 100,101, 102, 103 that are based on the same functional principles as above, and that are required to keep to the spatial motion course determined by the same Tw time patterns as above. A prerequisite for perfect functioning of such an arrangement is the utilisation of extremely fast processors for the operation of the subsystems 90, 91, 93, 94, and 95. The current motion course of the autonomous vehicle can be made approximately isomorphic to the referential motion course only if the recognition of the significant Tw '(nnnn) sequences (i.e. the reference data), the recording and analysis of the current Tw sequences (actual data), the computation of the control parameters and the application of the energy impulses 96, 97 all occur nearly in real time. The vehicle would then display behaviour similar to a "power servoloop" of the known type. This similarity can be confirmed simply by increasingor decreasing the base frequency fn of the clock 85, whereby the entire temporal course in all motionphases is accelerated or decelerated, in an absolutely synchronous manner. Each external intervention that tries to alter or disturb the motion course is counteracted automaticallyby the drive mechanism of the autonomous vehicle. Therefore, an autonomous mechanism working along these principles is comparable with a "live organism". Since in the system components 90, 91, 93,94 and 95 a tendency is programmed that continuously optimizes the analysis and interpretation of acquired time parameters (for example, to allow only "authentic data"; i.e. those Tw'(nnnn) time data that pertain to the shortest and most efficient path to follow). In such a mechanism, there would then exist the tendency not only for temporal and motoric auto-adaptation, but also for optimization. (This is inherent in molecular/ biological structures of organisms (see description to Figs. 4a - f).) The system is also capable of determining priorities, as well as of deciding in favour of Tw time data sequences that correspond to some other regression curve, if an irregular track deviation that cannot be stabilized by the control module 95 is recognized; whereupon, for example, the vehicle emulates a new motion course and a new speed time curve (timing). The memory of the TICM 86 can store any alternative motion scenario in the form of Tw time data patterns, which are accessed if a certain course deviation makes it necessary to do so. In this way, crash situations are recognized as soon as the danger becomes apparent, and can be avoided, since the vehicle is ready to react in an autonomous manner. The system goes out of control ("chaotic condition") only when no segmental regression curve derived from prior recorded Tw-sequences can been found that converges to a segmental regression curve derived from currently recorded Tw-sequences. The author terms this process "motoric auto-adaptation", or "auto-emulation". In order to be able to identify temporal-spatial deviations of the physical surroundings from the subjective view of the autonomous system, it doesn't suffice in most cases just to scan external structures, land marks and light conditions by means of optical or photoelectric sensors passively. 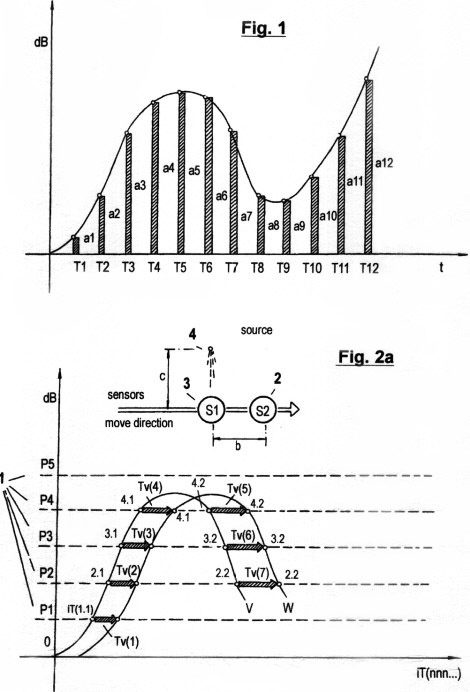 It is usually necessary to sense also height deviations by means of inclination sensors; uneven surfaces by means of pressure detectors or acceleration sensors; stationary acoustic sources by means of microphones; gradients by means of magnet field sensors; and positions by means of GPS; in order to acquire sufficient STQ parameters for a reference base. All recorded Tw'(nnnn..) time data streams are stored in the memory of the TICM. One can conclude from this that the adaptability and self-organisation capability of an organism (or autonomous auto-adaptable mechanism) increases in proportion to the quantity of all available sensors, or, respectively, to the number of STQ parameters that are available for the auto-adaptation process. Another important point is that in an autonomous system, there can be no timing without an accompanying time recording (=STQ quantization). Auto-adaptive processes and mechanisms of the described type will be indispensable for many future tasks in the high technology sector; for example, in the development of autonomous robot systems. An example of such a task is the following. An automobile that must find its way through traffic autonomously, safely and efficiently, must be capable of holding lateral and frontal distance margins, as well as speed courses, fixed. This automobile, moreover, would have to be able to execute autonomous overtaking procedures, and to recognize dangerous situations in advance and avoid them. This is only possible if the onboard computer of the vehicle is interconnected with a multiplicity of different sensors that record a diverse variety of signal sources; and if the vehicle is equipped with extremely fast and efficient hardware and software that can process the STQ time data required for auto-adaptation, approximately in real time. Future types of microprocessors could be enhanced with hardware structures that perform the functions described above. Fig. 6a shows a configuration of a simple embodiment of an aspect of the invention, in which the STQ(v), STQ(i), and STQ(d) quantization methods introduced in Figs. 2a - c are applied to the recognition of spatial profiles or structures. In the application shown here, a robot arm, on which two adjacent metal sensors 104, 105 are installed at a distance b apart, must be capable of distinguishing theprofile of the metal rail 106 while moving at various speeds along any of the rails 106, 107, 108. If the sensor head is moving at height h in the designated direction, then the v sensor 104 (S2), and then the W-sensor 105 (S1) in turn, approach the low sensitivity area designated here as perception intensity zone 1. The lowest threshold value P1 is passed through by the signal amplitude, and the acquisition logic 109 - mainly consisting of elements 81, 82, 83, 84, 85, 86, 87, 88, and 89 (shown in Fig. 5) - begins to acquire v- modulated STQ(i), STQ(d) time sequences Tw(1,2,3...n) and Td(1,2,3 ...n), which are stored in the TICM memory (A) 110. The same time data acquisition process recurs when sensors 104, 105 meet the next higher perception area zones 2 and 3, and when the signal amplitudes break through the potentials P2 and P3, which are preset in the threshold value detectors. Within the analyzer 112, in order to identify the metal rails 106 unequivocally (which would thereby show the characteristic profile), Tw and Td time data streams flowing into the memory 110 must be continually compared with the particular significant Tw', Td' time data pattern (B) 111 that has been preprogrammed as a "reference" pattern. Invalid or irregular time data are recognized, then deleted or corrected by the discriminator unit 113. This unit is programmed with the capability of improving the allocation and processing of data automatically (e. g. verifying and checking the time data in an auto-adaptive manner) as was already described with reference to Fig. 5. If a profile has been "recognized", then the analyzer 112 transmits a confirmation signal to an actuator unit of the robot, which sets a mechanism in motion that lifts the identified metal rail up from the ground, puts it on a conveyor belt, and so on. Figs. 6b - e show various diagrams and charts pertaining to Fig. 6a. all of the (iT)n... are volatile phase transitions, and never "time points" in the classic physical understanding. Fig. 6c shows vm diagrams of two motion courses of the sensors S1 and S2 along the metal profile being scanned. In the first case, the robot arm on which the two sensors are installed moves with an invariant speed of 1000mm/s over the profile (dash dot graph 114). In the other case, the arm decelerates from a speed of 1000mm/s at the first phase transition A to 690mm/s at the last phase transition H. The deceleration is not linear, and is shown in the graph 115. Tw` - Td` sequence 270, 270, 740, 620, 260, 1880, 2200, which serves as the significant time pattern, for this metal profile, that is already stored in the memory 111. If the analyzer decides that "covariance" is occurring, then a confirmation signal is transmitted to an actuator unit. The analyzer consists of comparators and/or "fuzzy logic"-IC's which ignore scattering in the boundary values (for example, decimal places are rounded up). Apart from these correction measures, tolerances, plausibility criteria and allocation criteria can also be programmed by software. Fig. 6e shows the same frequency and time data chart as Fig. 6d, but with variable scan speed course (vm). The relative velocity of 1000mm/s at phase transition (iT)A decreases to 690mm/s at the last phase transition (iT)H. The vm deceleration is not linear. In accordance with the graph 115, at the phase transitions (iT) A,B,C,D,E,F,G,H, the momentary speeds (vm1,2,3...) are measured to be 1000, 985, 970, 930, 820, 750, 720 and 690mm/s. The vm-adaptive modulation of the time counting frequency ƒscan(1,2,3...), described above, produces phase transition values of 10, 9.85, 9.70, 9.30, 8.20, 7.50, 7.20 and 6.90kHz, which are then used to quantize the STQ(i)- and STQ(d) elapse times. Since the STQ(v) quantizations also take place with the clock time base 200cs/b, the same Tw-Td elapse time sequence for the distances AB, BC, CD, DE, EF, BG and AH results, as seen in the chart of Fig. 6d. It is obvious from this chart that the recognition of the metal profile is guaranteed, whether the vm speed course is linear or not. Figs. 7a - d show various configurations of sensors used in the quantization of STQ(v) elapse times, or for the recording of the relative speed parameters (vm), respectively. The first three configurations show sensor constellations for 2-dimensional records of external events. Fig.7d shows a special configuration applicable for random 3-dimensional records of the physical surroundings. Fig. 7a shows a sensor constellation in which a bearing, carrying the sensors S1 and S2 on the same axis at a distance b apart, moves itself in the designated direction along an arbitrary track; or rotates itself about a point in space that is equidistant from both S1 (V-sensor) and S2 (W-sensor). This sensor system has only one degree of freedom. Fig. 7b shows a sensor constellation in which a supporting surface, carrying on the same axis two V-sensors S2 and one W-sensor S1 equidistant from each other as shown, moves itself arbitrarily in either of the two opposite directions shown along some arbitrary track; or rotates itself about a point in space that is equidistant from the v-sensors S2. The sensor constellations shown in Figs. 7a and 7b are sufficient for most robotic applications in traffic technology. Fig. 7c shows a configuration with a number of equivalent v-sensors S2 arranged as segments around a central w-sensor S1 on a circular supporting surface having radius b. 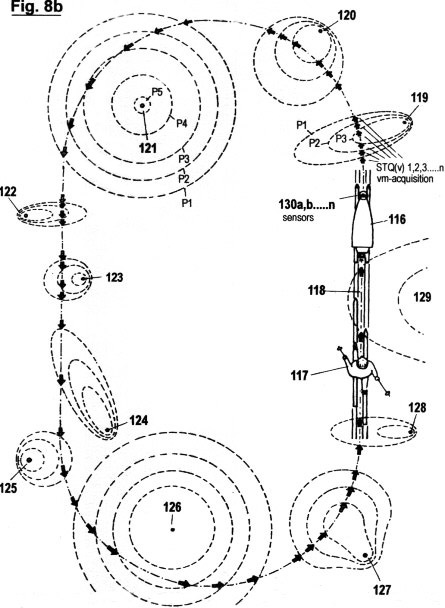 In this constellation, the supporting surface can move itself in any direction in the plane on an arbitrary track; or can rotate itself about a point in space that is at any distance from the sensors. This sensor configuration therefore has 2 degrees of freedom. Fig. 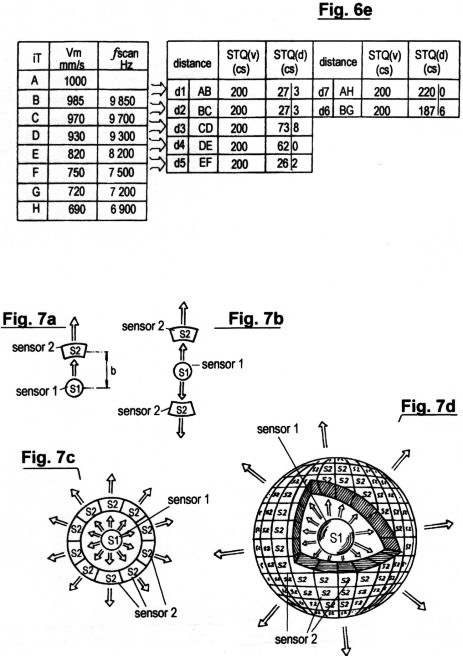 7d shows a sensor configuration with a number of v-sensors S2 arranged as segments on spherical supporting surface, with radius b, around a central w-sensor S1. The sensor constellation can move itself to any arbitrary position in 3-dimensional space, or can rotate in each direction around a solid spatial point A at arbitrary distance from the sensors. This configuration has 3 degrees of freedom.The sensor constellations shown in Figs. 7c and 7d come into consideration primarily for autonomous reconnaissance robots or flight objects, wherein energetic impulses could be applied in an arbitrary direction (e.g. by means of auxiliary rockets). of representing its own motion, as well as information about speed, lap times, intermediate times, start to finish times, and so on, on a monitor. It is, moreover, capable of outputting these data in an optical or acoustic manner. Fig. 8a shows a training robot 116 in front of a long distance skier 117. The robot vehicle envisaged for this application would be fitted with a ski undercarriage, allowing it to move with ease along snow-covered ground. It must be reasonably manoeuvrable in order to be able to match a human skier travelling in a long loop. The robot must be also able to create a new track on the same route where the former one has been covered by snow, and is therefore no longer visible. The training robot is especially suitable as an aid for blind skiers. The autonomous vehicle recognizes skiing circumstances for the blind skier, speaking out aloud hints, reports, warnings and so on by means of speech synthesis, which frees the skier and allows them more enjoyment. The robot vehicle 116 has a large number of sensors and electronic components, in the manner introduced in Fig. 5. It performs the same motion emulation, auto-adaptation and auto-optimization, often carrying out several practical tasks simultaneously. It acquires vm-adapted STQ(i)- and STQ(d) elapse time patterns from a multiplicity of sensors, compares these patterns with corresponding reference time patterns, selects the significant time data, and analyses and calculates parameters for the discrete energy impulses that manipulate the drive, brake and steering mechanisms. In the following, the essential components of the system, comprised of any of three specific types of sensors (optical, magnet field or GPS-positioning sensors) are described. Figs. 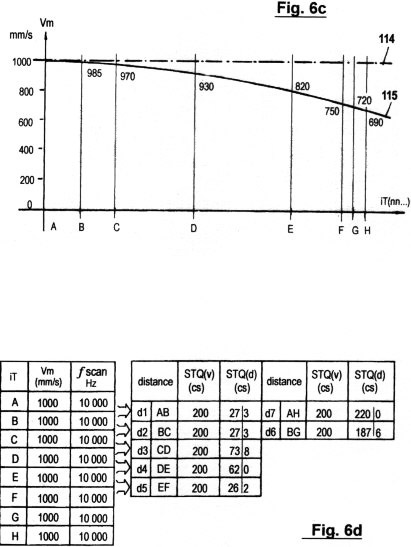 8b-d illustrate the recording of STQ(v), STQ(i) and STQ(d) elapse times (pertaining to Fig. 8a) with use of optical or acoustic sensors. The fundamental principles of its function have already been detailed in the description of Figs. 2a - c and Fig. 5. In the present figures, the training robot (the "electronic hare") 116 is moving with variable speed in front of a long-distance skier 117 in the loipe 118. 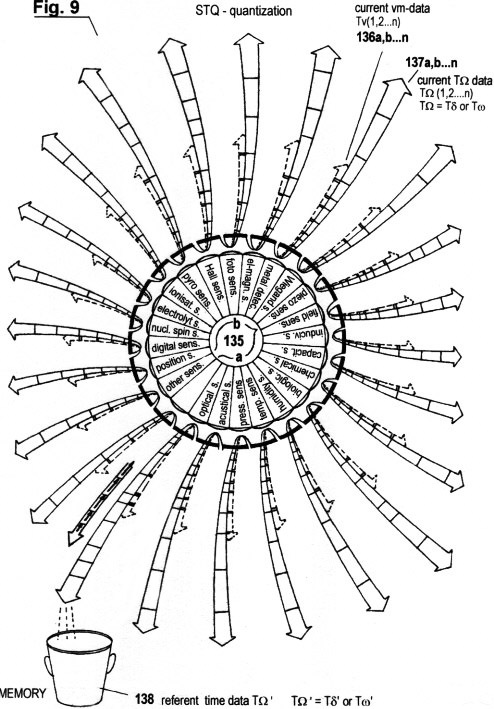 Optical or acoustic signal sources 119, 120, 121, 122, 123, 124, 125, 126, 127, 128 and 129 have been placed along the track in some arbitrary configuration, which are perceived by the corresponding sensors 130a, b,...n. At each phase transition through the threshold zones P1, P2, P3, P4, P5 etc., the designated STQ(v)- , STQ(i)- and STQ(d) elapse times are recorded. They generate the current vm-adaptive Tw '-T d '(1,2,...n) time data pattern, which is stored in the TICM. It is not crucial that the signal sources be fixed (e.g. they may be spotlights that illuminate the track for evening events). Signal sources can also be produced through differences in light intensity, contrast or colour, occurring beside trees, masts, buildings, slopes or significant land marks in daylight. Headlights could even be installed on the training robot itself, whereby the optosensoric recording of the reflected light and the evaluation of the light structures of the spatial surroundings may be used for recognizing its own motion. The same set-up may be used also with ultrasound sensors. On the other hand, acoustic signal sources could equally well be of natural origin; for example, the sounds of a brook running beside the loipe, or a waterfall. Generally, any volatile combination of light and shadow, or any noise source, can be decisive in the recognition of a certain object . The particular identity of the object may be determined by comparison of vm-adaptively recorded STQ(i)- and STQ(d) elapse time patterns with the Tw '-T d '(1,2,3...n) patterns, which are stored in the TICM and which represent each individual external object. In order to simplify the present description and demonstration, it is assumed that the signal sources 119 ...129 in Fig. 8b are lamps installed along the robot's route, making it possible for the robot to use the loipe at twilight or in darkness. 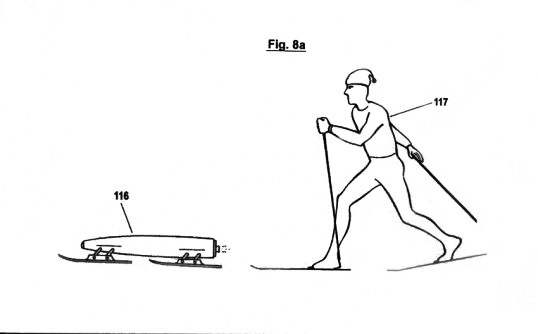 According to the primary domain of application of such a robot, the training robot 116 skis with precision behind the skier 117 along the skier's track, with all STQ time data vm-adaptively recorded and stored in the TICM working memory (see also Fig. 5). The distance between robot and user is precisely controlled by a distance sensor. However, in order to be able to invoke the robot vehicle's drive, brake and steering mechanism, STQ time data that could serve as reference data must already have been loaded into the TICM prior to the journey. Therefore, as a first step, the acquired time data are stored in the TICM reference memory; i.e., Tw -T d (1,2,3...) are mapped to Tw '-T d '(1,2,3...) initially. Subsequently, the emulation of the skier is repeated several times, with increasing processing speed as the robot learns more about the skier, and with variable speed and track courses; whereupon more and more covariant Tw '-T d ' time data patterns are contained in the reference data memory, which the robot's discriminator and analyser can access (see also Fig. 5). The interpretation and optimization program is put into action, which filters through only "authentic" T w '-T d ' time data that are deemed to pertain to the best and most efficient trajectory of motion, and which eliminates at the same time those data recognized as "irrelevant". This resembles a "learning process" that the robot vehicle has to undertake until it can finally ski "autonomously"; i.e. relatively freely, and in accordance with self-appropriated patterns and self-decided criterions, without any remote control or regulation by a pre-programmed algorithm. Upon reaching this stage, the training robot functions as a "trainer" or "pilot" who has the task of helping the user find ideal speeds, the best track and optimal timing. This optimal information that is communicated to the user is only that which has been learned by the robot itself. The training robot continues to improve itself also during this "practical work" (i.e. while helping the user), in continually optimising and supplementing the STQ reference data stored in the TICM. The ability to identify and recognize trajectories of motion or external signal courses and objects is always upgradeable. It depends on the quantity and variety of sensors used, as well as on the memory capacity of the TICM. Thus it is possible to induce the robot vehicle to recognize dangerous situations and to warn the user acoustically or optically; and to keep distances and times more exactly. In the present application, the vehicle performs automatic tracking and motion emulation along a loipe, even if the original track has been covered by snow and is no longer visible. Additionally, the robot vehicle has a monitor on which its own motion relative to its spatial surroundings can be visualised; as well as electronic measures to output speeds, lap times, intermediate times, total times or other relevant data in an optical or acoustic manner. An essential property of the robot vehicle shown here is that a simple adjustment (increase or decrease) of the central clock frequency can synchronously accelerate or decelerate the entire temporal course of all motion components (see also Fig. 5). For instance, this property is necessary in order to adapt the speed of the training robot in all sections according to the physical fitness of the user. This can happen manually by a remote control device, or automatically; for example, by a frequency or blood pressure data transponder. Fig. 8e shows the recording of STQ(v) and STQ(d) elapse times for the robot in Fig. 8a in the case when magnetic field sensors are installed. The signal source here is assumed to be the earth's magnetic field. In the example shown here, where the track forms a closed loop, the quantization of STQ(i) elapse times is inefficient, and therefore not undertaken. In the illustrated picture, the training robot ("hare") 116 is moving autonomously with variable speed in front of the long distance skier 117 along the loipe 118. Various vehicle position readings are produced along the track, with variable gradients to the earth's magnetic field 132. The magnitude of these gradients are acquired by the magnet field sensor 131. In this particular example, the magnitude follows a sinusoidal course. At each phase transition to the threshold zones P1, P2, P3, P4, P5, P6, and so on, the STQ(v) and STQ(d) elapse times are vm-adaptively recorded, which provides the current T( time data pattern that is stored in the TICM. The additional quantization of STQ elapse times from magnetic field gradients helps to locate covariant T w '-T d ' time patterns that are stored in the reference data memory. Consequently, the auto-adaptation and recognition capability of the robot vehicle is improved. The more sensors involved in the auto-adaptation process, the more "autonomous" is the described mechanism (see also Fig. 5). A self-organizing, autonomous organism based on biological or chemical structures, as discussed in Figs. 4a -f , can be produced in this manner. Fig. 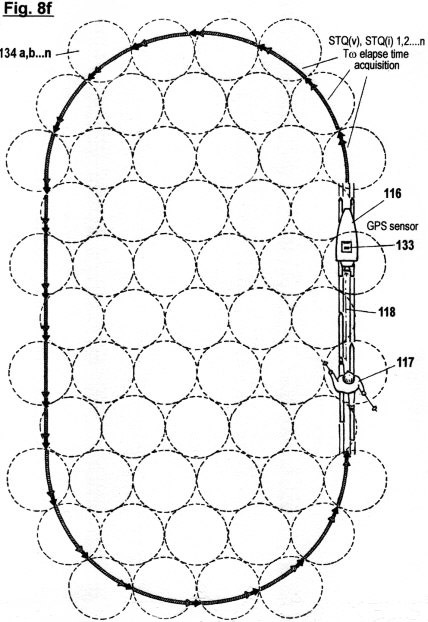 8f shows the acquisition of circular position fields by means of GPS sensors. These measurements (in addition to those shown in Figs. 8b - e) are used to improve temporal and motoric auto-adaptation and make auto-covariance behaviour and motion emulation more precise. A prerequisite for successful function is a GPS ("global positioning system") of high quality, which operates with extremely low errors. Since a square wave signal is received in this case (therefore no subdivision into distinctive sensitivity zones is possible) only STQ(v)- and STQ(i) elapse times, but no STQ(d) elapse times can be quantized - which, as we have seen, are measured between phase transitions from lower to higher potentials, and, respectively, vice versa. In Fig. 8f the training robot ("hare") 116 moves itself with variable speed in front of the long distance skier 117 along the loipe 118, while circular GPS position fields are produced along the track 134a,b,...,n, which are perceived by the GPS sensor 133 with high precision in a reproducible manner. The radii of the position fields, as well as the resolution between adjacent fields, is adjustable. With each detection of a new position field, a trigger signal is transmitted to the STQ acquisition unit, which records the STQ(v) and STQ(i) elapse times, and which then stores these currently vm-adaptive recorded time data sequences T w (1,2,3....) into the TICM. The ability of the robot to otimize auto-adaptation can be aided by counting and comparing the number of detected position fields, or by assigning a specific data code to time data within each crossed position field. Fig. 9 is a schematic diagram showing how time data streams are produced. Each transition of the amplitude through sensitivity zones or threshold potentials in redundancy-poor autonomous self-organized systems (such as mechanistic robot systems or organisms) leads to the quantization of elapse times, if these systems are equipped with sensors (or receptors) that are adequate for the perception of the external physical surroundings. It is asserted that the core technology shown in the diagram has universal validity and applicability. The diagram shows a highly simplified scheme for the technology, which can be understood plainly by a non-expert. consistent (see also THOMAS BREUER / 1997). also exists in atomic and subatomic structures). models and to meta-metatheoretical models etc. provability through continued self-generation (see also description to Fig.10). model described in this work. formal system, that it "induces to be".